I went out to let the goats out for their afternoon of grazing wherever they want, and poor little Angel (Willow’s twin brother), burst out of the barn with a bloody horn. I have no clue how he managed to break it, but here it is, in all its bloody gory. John held him while I have him a tetanus shot (he’s only had one CDT) and applied bloodstop and UltraBoss to keep flies away. I must admit he is not a tame little buckling at all. I had to actually force his mouth open to give him a peanut because he would not take it from me. He promptly spit it out and then picked it up off the floor and gobbled it down. I have to go figure out what he got caught in, and it’s time to distribute the fly predators, also. 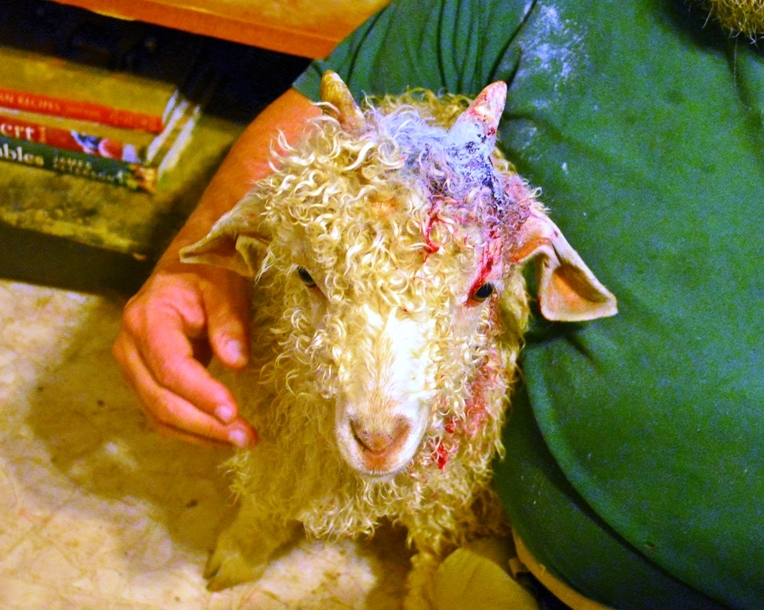 This entry was posted in Goats and tagged angora goats. Bookmark the permalink. Regarding her “About Beth Donovan.” I object to her characterization of her cooking. She cooks as well as she shoots. The rest of it, yeah, that’s spot-on.